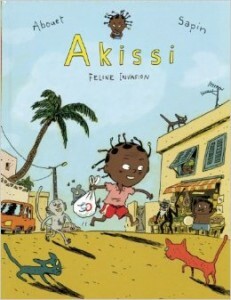 ”Akissi” av Marguerite Abouet, seriealbum med bilder av Mathieu Sapin. ”Published in English for the very first time, this best selling French comic follows the adventures of a West African girl. Poor Akissi! The neighbourhood cats are trying to steal her fish, her little monkey Boubou almost ends up in a frying pan and she’s nothing but a pest to her older brother Fofana. Marguerite Abouet was born in Abidjan, Ivory Coast, in 1971. At the age of twelve, her parents sent her to live with her uncle in Paris in order to pursue her education. 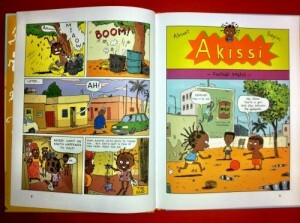 Marguerite is also the director of a charity that she created to help children in Africa get better access to books. Mathieu Sapin was born in Dijon, France, in 1974. He studied at l’Ecole supérieure des Arts Décoratifs de Strasbourg before becoming a renowned illustrator for children’s magazines and publishers in France. He’s also the author of a comic for adults called Supermurgeman. 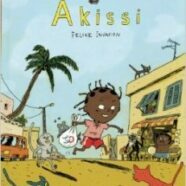 Akissi was awarded a Kirkus Star.